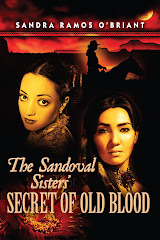 Saturday was a fun and fulfilling day that began with a reading from The Sandoval Sisters at the Los Angeles chapter of the Historical Fiction Society. I had the opportunity to not only meet other writers, but also readers of historical fiction who were looking for something new. That evening was very special. 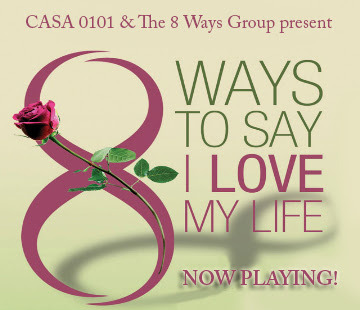 Not only did my husband and I get together with old friends we hadn’t seen all summer, but we headed out to Boyle Heights and Casa 0101 theatre for the play, 8 Ways to Say I Love My Life. The 2009 Imagen Award-winning show has been restaged in celebration of the publication of the book by the same name. As you might guess from the title the subject is self-affirmation, but the plot turns on how the eight writers whose stories are performed got to this point. It wasn’t easy, and it wasn’t always pretty. The monologues are short, tight, and focused on domestic violence, the loss of a friend and mentor, latchkey children taken from their mother and put into the foster care system, a father diagnosed with schizophrenia, the choice not to have children, attraction to losers, and taking a chance to live your dream. These women don’t feel sorry for themselves, both in terms of what life dealt them, and their own choices. Mistakes and screw-ups are described with humor, and their Aha! moments are met with forgiveness for any part they may have played in their in own low self-esteem days, which also happens to be the title of Josefina Lopez's story, My Low Self Esteem Days, performed by Yvonne DeLaRosa. Pilar of Strength, a monologue written by Margo De Leon and performed by Kikey Castillo, struck a personal note with one of my companions, and Bel Hernandez Castillo's The Power to Say You Belong spoke to me loud-and-clear when she related her youthful ambition and the chances she took to achieve it. I so enjoyed your reading, especially from the voice of each of the sisters. It was like hearing ghosts sharing their secrets with us. And it wasn't just the sisters' ghosts who were speaking to us. It was also the village folk, with all their superstitions and vulgarities and just plain small town habits. Did any of us remember to share what inspired our writings? That would be fascinating grist. It looks like you definitely had a most wonderful day Saturday. Thanks for sharing yourselves (you and your story) with us!